The first (Faulkes 2010) used surveys; the second, Google alerts (Faulkes 2013); the third, online auctions, and (Faulkes 2015a); the fourth (Faulkes 2015b), classified ads. 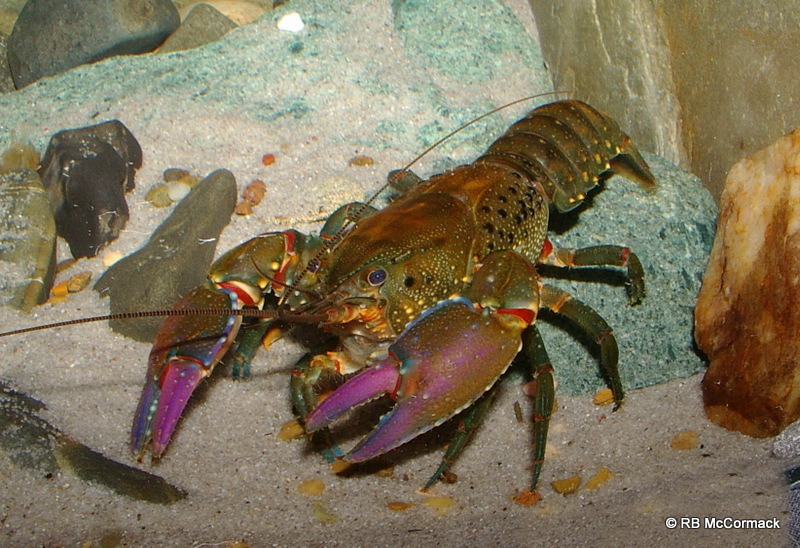 The fourth one was short, but I pushed it out because I thought documenting the illegal sale of marbled crayfish in Ireland would be useful for policy makers. But there was an obvious question: if I blundered across ads for illegal crayfish in Ireland without looking, how many illegal crayfish would I find if I went looking? As soon as I started writing, I started thinking, “Uh oh.” I realized that there were gaps in what I was collecting (sigh), but that I might still have time to address (whew!). Writing forced me to articulate what I was doing, and I started imagining what the reviewers might say if I didn’t have certain things. An advantage of having a scientific franchise is that some things get easier. I learned that it was useful to have a project run one calendar year. It’s a time frame that people get, and is manageable. You have a clearly defined end date, so you know how far along you are at all times. Data collection finished 1 January, 2016. Because I had done quite a bit of the leg work up front, I was able to finish writing and submit the paper less than two weeks later. Where to submit the paper was tricky. Some articles have obvious homes, but there wasn’t for this one. There is no Journal of Pet Trade Studies. I looked at a lot of journals before settling on Biology and Environment. I had never published there before, but I couldn’t get a better fit than a regional Irish journal with a broad editorial mandate. There was a cost to that good fit, though. The journal had no open access options. I’ve been trying to publish my papers open access when possible, and this is one of the first papers in a while (besides book contributions) that isn’t. In this case, I thought the fit was so good, this journal was the best chance for my paper to find its target audience, and that was worth the sacrifice. Once the paper was submitted, I waited. I sent an email after two months, asking if I could post a pre-print while waiting for a decision. I was politely asked not to, so I didn’t. I waited some more. And waited. After six months, I sent an email making sure nobody had forgotten my manuscript. (Because that’s happened to me before.) I was assured it hadn’t been. I waited some more. I checked in again around the nine month mark to make sure the manuscript was still a live concern for the journal. The editors really wanted a particular person to review this paper, and was just waiting on the one review to come in. So, yes, this is one of those frustrating cases where the editorial decision making was slowed by reviewers not promptly returning reviews. I was a bit miffed, since the paper was neither long nor complex, and I didn’t think it needed the many months it took to review. But I was pleased that I had learned to be more persistent in checking with the journal. That said, once the reviews were back, I was pleased with the rest of the journal’s service. The typesetting and copy editing process was thorough and responsive, and it felt like they genuinely wanted to get everything right. It’s funny to think that when I started my academic career as an undergraduate, I didn’t have an email address. The Internet existed, but practically nobody knew about it. The web was about a decade away. And now, I can publish papers about Ireland from my desk in Texas just by watching what people do the Internet. Like any good franchise, I am already working on the sequel. Perhaps there is a message here–that the implementation of any barrier to the movement of an unwanted species is always likely to be too later–and that such a move has to be combined with an appropriate follow-up management plan? This relates to a point I made on Twitter last week. 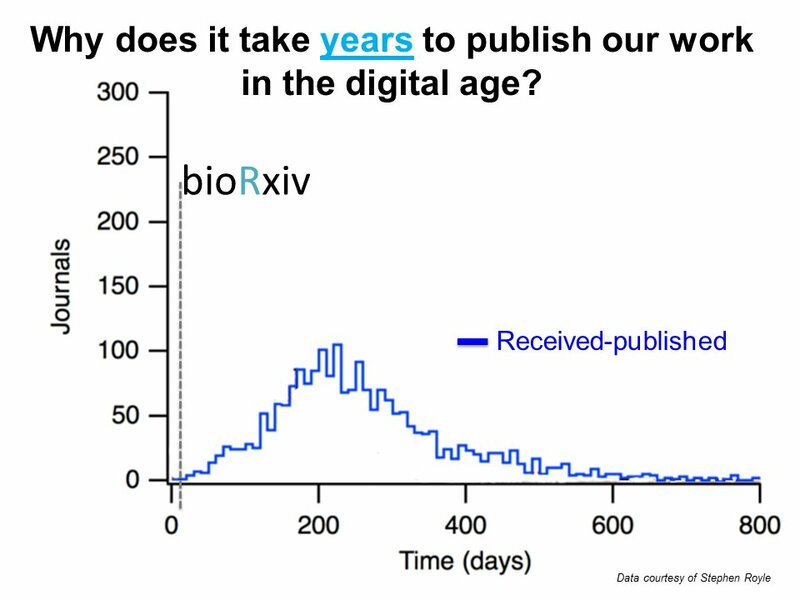 It’s not fair to compare the delay in posting a pre-print to the delay in publication in a journal, as Leslie Vosshall did. I say that knowing that I myself have complained about editors have never helped papers become more readable. But I think that was a little unfair. For one, I’m a native English speaker, and though I say it myself, a pretty good writer. My writing probably doesn’t need dramatic revision to be readable. Since I wrote that blog post, I’ve worked with more journals. Several of them actively made my paper better after acceptance. Like this one, the improvement came in the copy editing and proofing stages. Lots of little details got detected and corrected before the final version was produced that would appear in the journal, and be the version of public record. I greatly appreciated that intense, detailed, checking of the text. That care showed up in the production of figures and tables, too. Sometimes, it seems that some scientists are so confident of their abilities that they think their uncorrected, unreviewed manuscript cannot possibly be improved. Reviewing and editing are just unnecessary delays in getting their brilliant science out to the world . I think that such manuscripts are extraordinarily rare. 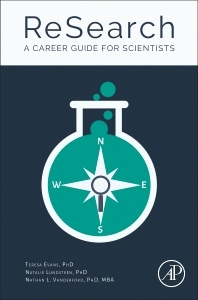 I just signed an author’s agreement for ReSearch: A Career Guide for Scientists. It’s been a while since I’d thought about this project. I didn’t write it, or even a chapter. Back in 2015, one of the co-authors, Nathan Vanderford, cold emailed me asking if I would be willing to write something about “personal branding.” I said, “Sure!” So I wrote a little sidebar as a case study. The book is slated for release next month. I’m curious to see how my little contribution is woven into the text. Last week, I was out on the beach at South Padre Island, collecting sand crabs for my research. This involved lots of shoveling. When I do this, I often have people come up and ask me what I’m doing. A common guess is clams (none worth digging for on South Padre). Jokingly, people ask if I'm looking for buried treasure. Normally, I try to cut the conversation short. I’m working. If you’re trying to get something done, it’s not always the time you want to chat with others. I guess my pronunciation was at least understandable. I was weirdly proud of that. Hooray for arbitrary large round numbers! 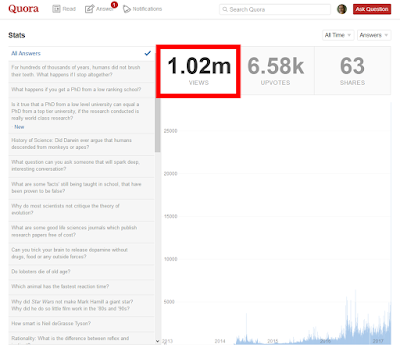 My answers on Quora have tallied one million views on Quora. And yesterday saw my most views ever. 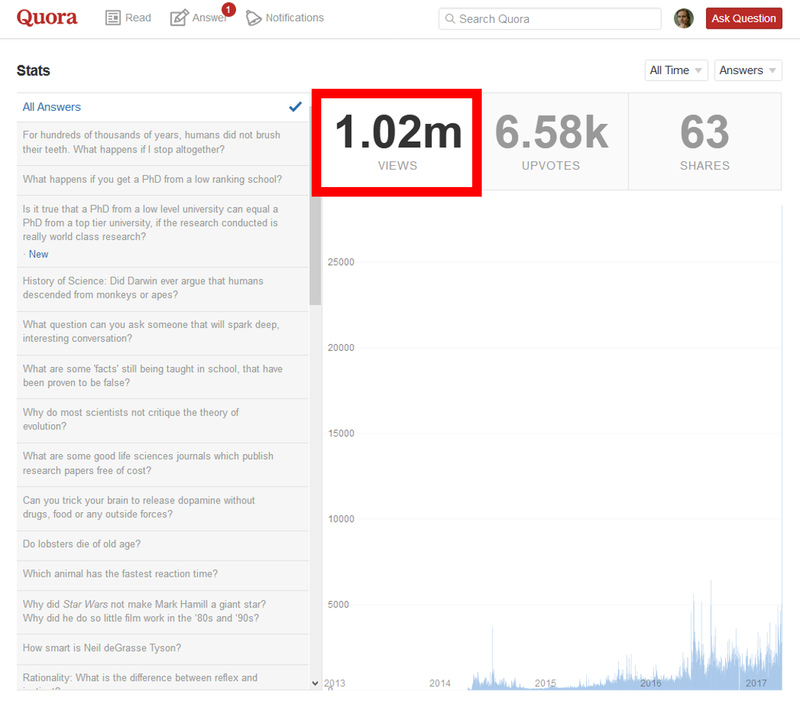 Not sure what answer is getting all that traffic. Australian crayfish are often like the country itself. Big, brash, and often highly charismatic. This newly discovered crayfish is a fine example of that. Sadly, the authors expect this species is already criticially endangered. 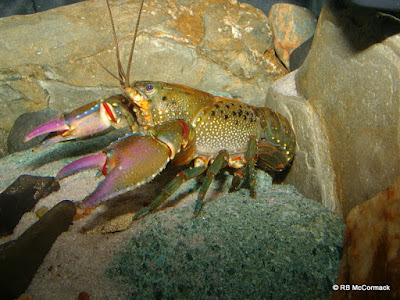 Like many crayfish species, it has a tiny distribution. But in slightly more cheerful news,the authors note they are working on describing even more new species in this genus. This book is also dedicated to those who come after and who, instead of contemplating inventing a new dance notation system, discover what has already been achieved and contribute to the art of dance by directing their energies and talents to the perfection of the best one available. I haven’t read this book in decades, but this quote stuck with me. I think the book said something like there had been a new dance notation system proposed every four years. I could sense her mild frustration that there were so many different systems out there, and people weren’t building on previous work. They were blowing things up and starting from scratch, every. Single. Time. I think of this quote when people suggest that we should have new scientific journals. Or new programs. Or new administrative structures. So often our reaction to finding something that we think is not performing to our expectations is to walk away from it and start over again. But I like Guest’s approach: direct energies and talents to perfecting the best ones available. Guest AH. 1989. 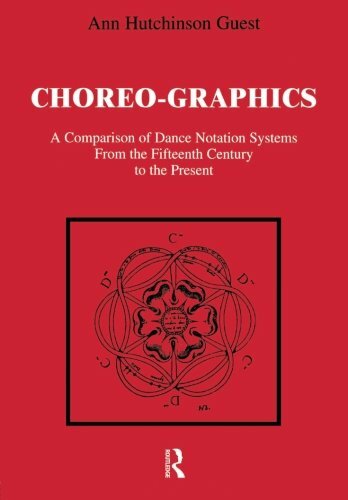 Choreo-graphics: A Comparison of Dance Notation Systems from the Fifteenth Century to the Present. Routledge. Experiments are intended to show one thing effects another. However, not everything affects something else. Many experiments that show “no effect,” or “p > 0.05” are often called negative results. The general wisdom is that negative results are harder to publish than one that show an experimental manipulation did have an statistically significant effect (“p < 0.05”). Anecdotally, the paper of mine that had the longest, toughest slog to publication was one with negative results. Is the solution to this problem to create another journal? No. First, we already have journals in biology that specifically say in their titles that they exist to publish negative results. We have the Journal of Negative Results in BioMedicine (started 2002) and Journal of Negative Results - Ecology & Evolutionary Biology (started 2004). Second, we have journals that, while not specifically created to accept negative results, specifically include publication of negative results in their editorial mandate. Usually, this is phrased as “reviewed only for technical soundness, not perceived importance,” and these have become known as “megajournals” (regardless of how many papers they actually publish). This format, pioneered by PLOS ONE, is still quite new. 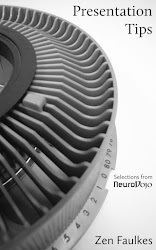 Several megajournals are less than five years old (click to enlarge pic below). The age of these journals is important to consider when talking about publishing negative results. In my experience, many academics take a long time to realize when the publishing landscape has changed. For example, I have been in many discussions with scientists who are actively publishing, active on social media, who mistakenly believe that “open access” is synonymous with “article processing charge” (APC). This is incorrect. It takes time to change academics’ publishing habits. 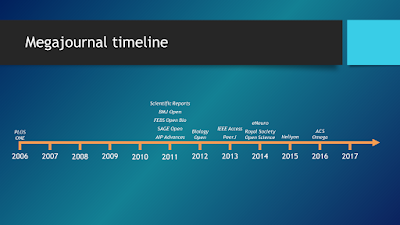 Five years is not enough to see how the creation of these journals affects the publication of negative results. And more journals are on the way. 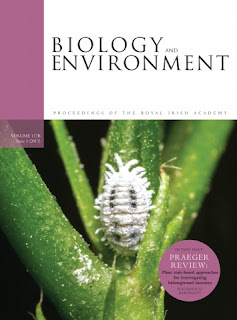 The Society for the Study of Evolution has Evolution Letters coming, and Society for Integrative and Comparative Biology has an open access journal coming (though it seems likely these will review for “impact,” not only for technical soundness). I do realize that some journals are better at upholding this editorial standard than others. For example, sometimes PLOS ONE reviewers have sent back reviews considering “importance” of the findings, even though the journal tells them not to do that. In biology, you probably have at least six perfectly respectable journals that happily publish negative results. 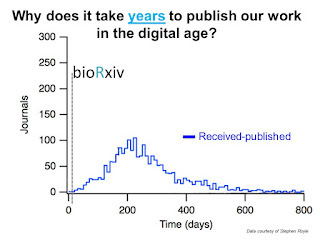 This is why I contend that we do not need to create new journals for negative results. We need to use the ones we have. I think the underlying problem with discussions of negative results is that we talk about “negative results” as though they were all the same, scientifically: “no effect.” All negative results are not equivalent; some are more interesting than others. Below is a crude first attempt to rank them. Negative results that refute strongly held hypotheses. Physicists hypothesized that space contained an aether. Nope. Harry Whittington though the Burgess Shale fossil, Opabinia, was an arthropod. Nope. That was just a big old bunch of negative results. But they were clearly recognized as important in getting us off the wrong path. “Hey, I wonder if...” (HIWI*) negative results. These are negative results that have no strong hypotheses driving the experimental outcome. 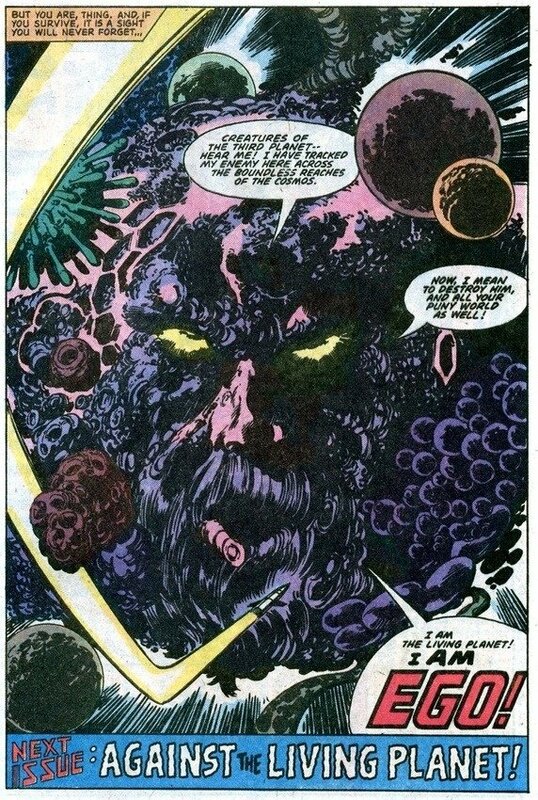 Like asking, “What is the effect of gamma rays on man-in-the-moon marigolds?” Well, do you have any reason to believe that gamma rays would affect the marigolds differently than other organisms? If you don’t, negative results are deeply uninteresting. In other words, that results are negative has very little bearing on how people view their importance. The importance of the hypothesis that underlies those negative results play a much bigger role in whether people are liable to think those negative results are interesting. That is, even if you have another journal specifically for negative results, people are still going to think some results are more interesting and publishable than others. People whose negative results fall into the HIWI category (which may be a lot of those experiments) are still going to have a rough ride in publication, even for journals that consider negative results. This post prompted by Twitter discussion with Anthony Caravaggi.